I already baked Pizza in a lot of variants. And as I like to test new recipes, today I present you a variant with firm dough and sweet starter. 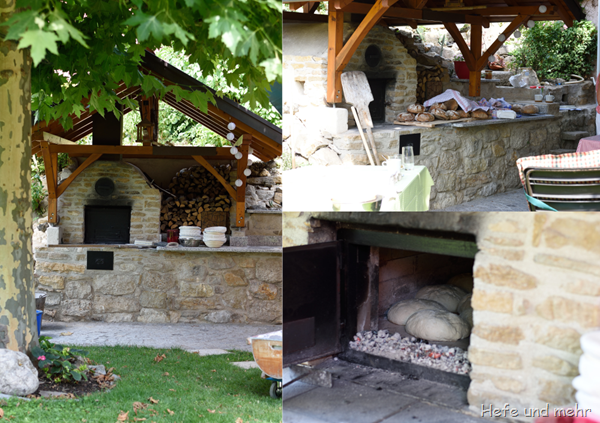 The use of an rather firm dough has – especially when you bake in a wood fired oven – the advantage of easy handling. To archive a bubbly crust requires a well proofed preshaped doug. As I learned from a pizzaiolo the dough balls are in perfect condition, if you turn them and there is a lot of small and middle sized bubbles at their bottom. Big bubbles aka “holes” are not so good as they tend to make the dough base uneven. Forming the dough base is very easy if the dough balls are well proofed, too, because the gluten network is relaxed at this point. Due to the sweet starter and a long cold fermentation in the fridge, the flavour is complex with subtle notes of lactic acid. It adds a deepness to the pizza flavour which makes it to a favourite of mine! 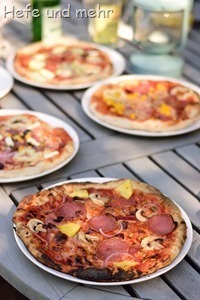 I know, I know … there is already more than one recipe for Pizzadough on this blog. 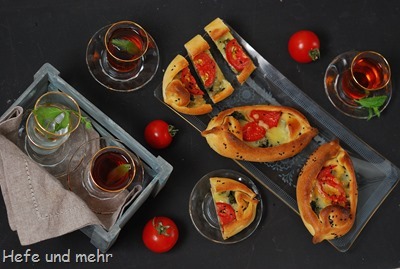 But this dough is so simple and good, I had to post this recipe as well. It is a “What I have in the cupboard” recipe, when I was to lazy to go to the pantry to fetch another bag of wheat flour. So I used some leftover spelt flour instead. I mixed the dough and folded it for some times, and put it then in the fridge, similar to the Wurzelbrot or the baguette recipe. Very easy! 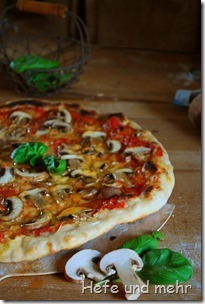 When I came home the next evening after a long workday, I started to prepare our pizza. And when I stretched the dough to a flat square I realized what a great idea it was to add some spelt. The spelt flour made the dough very easy to handle and to strech in form, while the long and cold fermentation creates a great flavour and big air bubbles in the dough during baking. I like to watch the regional TV shows from other parts of germany because I always learn something new about this region. 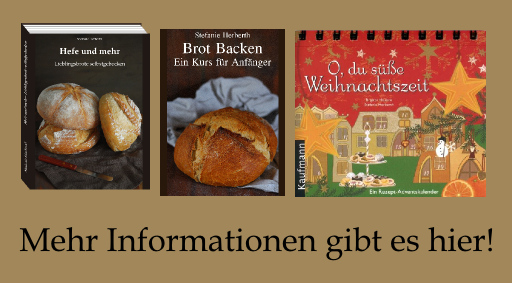 This time I learned about a pie called “Salzekuchen” in a TV show about the hessian kitchen. After a little search in the internet, I know now that Salzekuchen is also called Ploatz, Plootz or Bloads and is typical for Hesse, Parts of Franconia and the region of Rhön and Hohelohn. 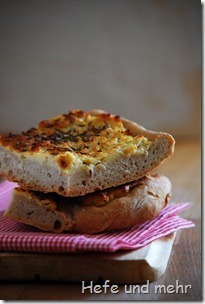 It is made of a Bread dough which is topped with a potato or onion mixture. A typical dish in former days, when the village meets for baking bread. For lunch a part of the dough was set aside and used for Salzekuchen. I decided to make the potato salzekuchen, but I change the recipe a little bit. The original recipe called for about 200ml canola oil. I think this amount is a little bit to much for nowadays where people normally spend most of their days in offices instead working heavily on a farm. This lighter variant of Salzekuchen is very delicious and we will eat this again, for sure! At the blog Baking Banter of King Arthur Flour MaryJane Robbins posted a recipe for a white Pizza, with no tomatoes at all. 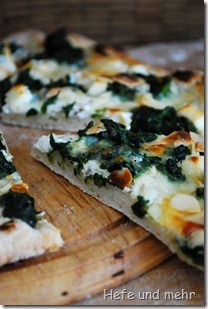 Instead of Tomato sauce the pizza is spread with ricotta and topped with spinach, feta, garlic and mozzarella. And then I saw on Susans blog her great farmer market pizza and my wish to try a white pizza increased. And Pizza is always loved in this house so my question if we should bake this kind of pizza for lunch was positively answered. For the crust I played once more with this recipe. I like it because I can use the remaining dough to make a great bread, too. I added a Pâte fermentée to the recipe to make the crust even more tastefully, and used only wheat flour instead of mixing spelt flour and wheat flour. For the topping I used the things mentioned in the recipe on Baking Banter and was rewarded with a delicious pizza. I have to survive a two day long meeting and then my well-deserved vacation will start. The last days I spent more 12 hours or more in the Lab to get the last missing data for the Paper. I shocked our cleaning lady regularly when I entered the building at 6.50 am. She does not expect somebody saying “Good Morning” to her at this time of the day. Because I spent so much time in lab there was nearly no time for cooking or baking. But I still get delicious dinners because the boyfriend take care of cooking. One evening, when I was still in the train station on my way home, I told him what he would need for an onion tart and he prepared the dough. When I came home the dough had risen finely and we prepared the filling together. The theme for the sixth birthday of Zorras Blog Event is vegetables “In Hülle und Fülle”. That means vegetable either as filling or filled. To my birthday brunch I serve cute little mushroom quiches. Filled with mushrooms that is maybe not the most creative submission but it fits to theme and the little quiches are really delicious. As dough I choose the dough I found at Chili und Ciabatta . Petra used it for her kohlrabi quiche. 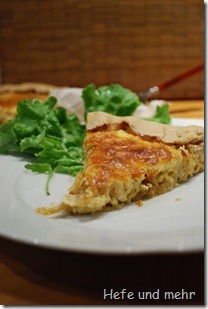 Quiche dough Cafe Solo comes from Nicky of Delicious Days. 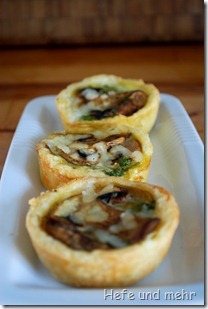 The filling is a simple one: Mushrooms, thyme, parsley, topped with goat gouda. Baked in Muffin tins they have a perfect size for a Brunch. You can eat them with two or three bites. The oven was broken this week (he is repaired now, but I will tell about this later) but luckily we own the small pizza oven Alfredo and could bake our Dinnete! 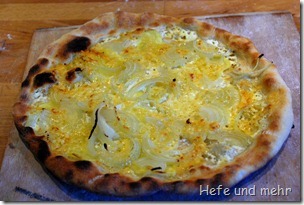 Dinnete is the swabian variation of Tarte Flambee. It is a flatbread topped with sour cream and onions, potatoes, bacon or cheese. We decided to try a combination of thin potato slices, onions and cheese. My boyfriend look a little bit unhappy when I told that I would like to top the Dinnete with potato slices, but the taste of the baked Dinnete won him over. 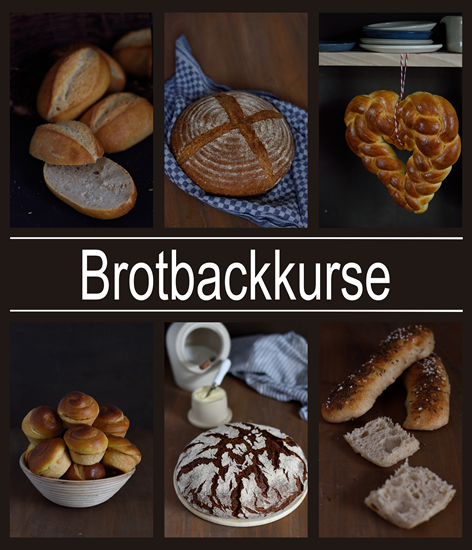 This is a recipe we will bake again! 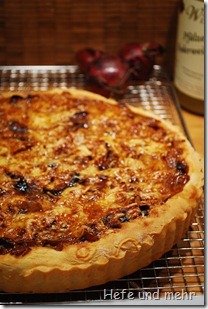 A Tart filled with cauliflower and onions sounds not exiting. But if you roast the cauliflower in the the oven and caramelize the onions and if you then add mustard and a flavourful cheese you get a small explosion of diffrent tastes with every bite. There is the sour taste of mustard, sweet from onions, the dark down-to-earth taste of cauliflowers topped with flavour of baked cheese. I have to admit that it was the mustard that make me curious about this recipe at Smitten Kitchen. Mustard in a Tarte? That sounds good! And it tastes good!